Curioso a la manera vegetal - Paul Klee was a Swiss painter of German nationality, whose personal, often gently humorous works are replete with allusions to dreams, music, and poetry. His highly individual style was influenced by movements in art that included expressionism, cubism, and surrealism. He was, as well, a student of orientalism. If listed sizes are not in proportion to the original, don't worry, just choose which size is similar to what you want, we can offer oil paintings in a suitable size, painted in proportion to the original. If you would like the standard size, please let us know. Need a Custom Size? Fundation Paul Klee. Kunstmuseum. Berna. Why settle for a paper print when you can add sophistication to your rooms with a high quality 100% hand-painted oil painting on canvas at wholesale price? Order this beautiful oil painting today! that's a great way to impress friends, neighbors and clients alike. 100% hand-painted oil painting on artist grade canvas. No printing or digital imaging techniques are used. In stock items ship immediately, usually ships in 3 to 10 days. $12.95 shipping charge for small size (e.g., size <= 20 x 24 in). The cheapest shipping rate from DHL, UPS, USPS, etc. Canvas stretched on wood bars for free. - Need special frame for oil painting? Please contact us. Send you a digital copy via email for your approval before shipping. 45-day Satisfaction Guaranteed and 100% Satisfaction Guaranteed. You are not signed in. Select here to add this item to your default List. To create a new List, use the "new Wish List" option below. Data successfully added to your Wish List ! Would you like to publicly share your opinion of this painting? Be the first to critique this painting. Your critique is viewable immediately by the public. PaintingMania.com reserves the right to edit or remove inappropriate critiques. Paul Klee was born on December 18, 1879, in Munchenbuchsee, Switzerland, into a family of musicians. His childhood love of music was always to remain profoundly important in his life and work. From 1898 to 1901, Klee studied in Munich. Upon completing his schooling, he traveled to Italy in the first in a series of trips abroad that nourished his visual sensibilities. He settled in Bern in 1902. A series of his satirical etchings was exhibited at the Munich Secession in 1906. That same year, Klee married Lily Stumpf, a pianist, and moved to Munich. Here he gained exposure to Modern art. Klee met Alexej Jawlensky, Vasily Kandinsky, August Macke, Franz Marc, and other avant-garde figures in 1911; he participated in important shows of advanced art in Munich and Berlin. In 1912, he visited Paris for the second time, where he saw the work of Georges Braque and Pablo Picasso and met Robert Delaunay. Klee helped found the Neue Munchner Secession in 1914. Color became central to his art only after a revelatory trip to Tunisia in 1914. In 1920, a major Klee retrospective was held in Munich. Klee taught at the Bauhaus in Weimar from 1921 to 1926 and in Dessau from 1926 to 1931. During his tenure, he was in close contact with other Bauhaus masters, such as Kandinsky and Lyonel Feininger. In 1924, the Blaue Vier, consisting of Lyonel Feininger, Jawlensky, Kandinsky, and Klee, was founded. Among his notable exhibitions of this period were his first in the United States in 1924; his first major show in Paris the following year and an exhibition at the Museum of Modern Art, New York, in 1930. Klee went to Dusseldorf to teach at the Akademie in 1931, shortly before the Nazis closed the Bauhaus. Forced by the Nazis to leave his position in Dusseldorf in 1933, Klee settled in Bern the following year. 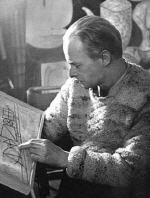 Klee died on June 29, 1940, in Muralto-Locarno, Switzerland. Copyright © 2007-2018 PaintingMania.com, Inc. All rights reserved.